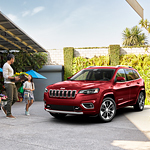 The Jeep Cherokee has long been a popular SUV for its rugged design and durability. The 2019 models come equipped with a number of safety options that provide the driver with a more convenient experience. See the latest models when visiting our RZ Motors facility. Test the features while indulging in a test drive. A stability control system helps keep drivers and their vehicles going along the right path. Should you accidentally veer from a lane of the road, the system provides an alert. The monitoring and regulating system is also designed to prevent rollovers. Drivers need not worry about venturing into another lane and overtaking a vehicle in the blind spot area. The detection system monitors the sides of the vehicle and alerts drivers to potential dangers. The system also monitors the region behind the Cherokee when the vehicle is in reverse.